Note: It doesn't actually melt. At least not by any way that I have tried. But that's okay because I don't like melted cheese anyway, so its not going to be something I miss. Overall its not bad though. What I like best about it is that it does not come from a cow. This creeps me out a little bit. What is it made of? not to burst your bubble, but that brand has milk protien, I think. Elliott's highest vote goes to all the tofuti cheeses--and they do melt pretty well--like for grilled cheese or mac and cheese or something. no worries, Vegan Gourmet does not have milk protein in it. i will try the tofuti cheeses next time if i can find them! Isn't admitting that you enjoy cheese (in general) just another victory for the powerful cow kabal. 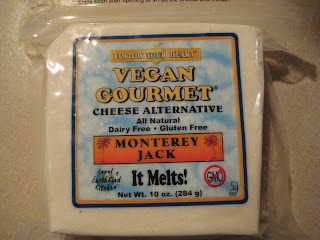 Now if they had vegan goat cheese, that would be what you wanted to go for.